In February, Lucari and his classmates (5 sections) took a break from academic work for 2 weeks and had a hands-on "Praktikum" (internship) at businesses, factories and other production sites in and around Nienburg. Attached, please, find his 6th report which deals mostly with the "Praktikum". Attached are the minutes from the October 2015 Sister Cities Board meeting. Ich hatte einen guten Rückflug nach El Paso und eine gute Fahrt zurück nach Hause. Weil ich um 1 Uhr am Sonntag angekommen bin, war ich sehr müde. Ich vermisse Deutschland und das gute deutsche Essen. Die deutsche Bratwurst ist sehr lecker. Außerdem mag ich die deutschen Brötchen. Bei beiden Gastfamilien gab es viel Belag für die Brötchen, zum Beispiel Honig, Schinken, Hähnchen, Salami, Zucker, Nutella und Erdbeeren. Das Sommerwetter in Deutschland finde ich gut, weil es im Juni kühl ist. Die Temperatur in Nienburg ist dann etwa 22 Grad (Celsius). Es gibt eine Menge Regen. Ich mag Regen, weil es in Las Cruces wenig Regen gibt. Nienburg ist wegen dem Regen sehr grün. Die Hillmanns, meine zweite Gastfamilie, leben in der Nähe von einem schönen Wald. Der größte Unterschied zwischen dem Südwesten der USA und Deutschland ist das Klima. Der amerikanische Südwesten ist sehr trocken und heiß. Die Sonne scheint oft. In Deutschland ist das Klima kühl mit hoher Luftfeuchtigkeit. Die Sonne scheint nicht so oft. I had a good return flight to El Paso and a good car trip back home. Since I arrived Sunday at 1 a.m., I was very tired. I miss Germany and the good German food. German Bratwurst is very delicious. I also like German “Brötchen” (rolls). Both host families had lots of spreads for the Brötchen, e.g. honey, ham, roasted chicken slices, salami, sugar, Nutella and strawberries. The summer weather in Germany is great because it’s cool in June (about 71.6 F). There’s a lot of rain. I like the rain because in Las Cruces there is so little. Nienburg is very green because of the rain. The Hillmanns, my second host family, live near a beautiful forest. In Germany, the hardest thing for me was the language. The people spoke so very fast. It was difficult following what they were saying. I finally understood more of the conversations by focusing on keywords and using context clues. It was not always easy because I did not have a large German vocabulary when I arrived. In class, my friends helped translate some vocabulary words I didn't know. That was very helpful. I would advise other American students going on a short exchange to Germany to bring along a “Taschenwörterbuch” (pocket dictionary). The more vocabulary you know the easier it is to understand. Another advice is to sleep during the flight to Germany. It helps prevent jet lag. "Life" at the German “Gymnasium” (=academic high school) is very good. During the breaks, students have more freedom than at an American high school. The students in my 8th grade class can go off campus. For some of the big breaks, my friends and I would get pizza at a nearby pizza shop. The food at school is also very good -- all freshly made. In American high schools, many foods have a lot of added preservatives. 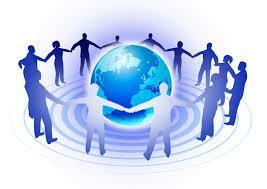 -- Some of the teaching styles are different. For example, most of the lessons are teacher-led discussions. There is also less homework. Teachers are stricter on homework, however. I find these teaching styles very good. The classrooms in Albert-Schweitzer-Schule are old. They do not have any air conditioning but they do have a lot of large windows that are opened to let the cool air come in. There are many big desks arranged in a u-shape. In front there is a blackboard with another blackboard behind it. My 6 weeks in Germany were very good despite the fact that I broke my right arm when I crashed with my bike. The people in Nienburg have been nice and helpful. I learned a lot of German at Albert-Schweitzer-Schule. Mr. Kerlin, the English teacher of my class and my German facilitator for this exchange, is very nice and funny. He likes to tell jokes to lighten up the mood of the class. This exchange has been very beneficial and helped me make new friends while at the same time helping to improve and expand my German skills. I would like to thank the many people of our Las Cruces-Nienburg Sister Cities partnership in the US and in Nienburg who have made this wonderful exchange possible. "I spent a very nice week with the Hillmann family where I like to ride the Go-Cart. The weather in and around Nienburg has been very warm with high humidity. Right now it feels as if Nienburg is hotter than Las Cruces! I also had a good week at school. On Monday, I went to the famous "Scheibenschießen" (a kind of marksmen's festival), [which is the biggest event in Nienburg]. Unfortunately I could not shoot because of my broken arm. This week my topic is the Albert-Schweitzer-Schule in Nienburg. It is a very old school. [Its origins go back to the Latin School of the 16th century. The main building - as we see it today - was built between 1904 and 1906. Like most German buildings], it has no air conditioning. When it's warm outside, it's also warm inside. -- We had a test in Math on which I earned a "1+" (A+). Apart from regular P.E., students can also participate in one of the rowing teams. "Rudern" (rowing) is so much fun. I'll row again next week when I'll be back with the Schulze family because they live very close to the Weser river. My teachers and friends have helped me a lot with improving my German language skills. My injured arm is also doing much better. " "My second week with the Hillmann family - my fourth week in Germany - was not really that good. This past Friday, on my way from school towards home, I crashed with my bicycle in a curve where there was lots of gravel. I injured my chin, my right wrist, my right hand as well as my left hand. An ambulance took me to the orthopedic hospital in Nienburg. The doctor was very nice. Today is Sunday and the sun is shining. I'm staying in the house, taking photos. My host mother is taking really good care of me. Now a few comments on classes at a German academic high school. They are really different from those at an American high school. The grading scale goes from 1 to 6, with 1 being very good and 6 insufficient. Students have their own classroom, and teachers go from room to room. During class, there are many more open conversations and discussions than in America. Oral participation is considered very important. -- Meals are different. We eat Müsli or whole grain bread or rolls with butter, cheese, jam or honey for breakfast; when the entire family is home at noon, we have a cooked meal. For supper, we eat open-faced sandwiches. "Schwarzbrot" (black bread) is a little sour but tastes really good with cheese, egg or Salami." "Ich spreche und schreibe nur Deutsch bei der Familie Hillmann, meiner zweiten Gastfamilie. Mein Gastvater spricht kein Englisch. Das finde ich wirklich gut. Ich habe eine gute Woche mit der Familie Hillmann verbracht. Alle sind sehr nett. Ich habe zwei Gastbrüder: Lauritz ist 14 Jahre alt und Brice ist 11. Die Familie wohnt auf einem schön restaurierten Bauernhof in Asendorf-Graue. Ich mag ihr Haus. Zur Schule kommen wir 1,8 km mit dem Fahrrad und dann ~30 Minuten mit dem Bus. Graue ist in der Nähe von Wietzen. Da schwimme ich mit Lauritz und Brice im Schwimmbad. Am Wochenende bin ich mit meiner Gastmutter und Lauritz nach Bremen gefahren. Die Stadt finde ich sehr schön. Heute werde ich 10 km mit Brice laufen. Insgesamt habe ich viel Spaß." Translation: At the Hillmanns', my second host family, I speak and write only German. My host father does not speak English; I find that really good. I spent a good week with the Hillmann family. Everyone is very nice. I have two host brothers: Lauritz is 14 years old and Brice is 11. The family lives in a beautifully restored farm house in Asendorf-Graue. I like their house. We get to school by bike (1.8 kilometers) and then we take a bus for about 30 minutes. Graue is located near Wietzen [translator's note: Exchange student Kathrin lives in Wietzen; - see the post about her.] I go swimming there with Lauritz and Brice. 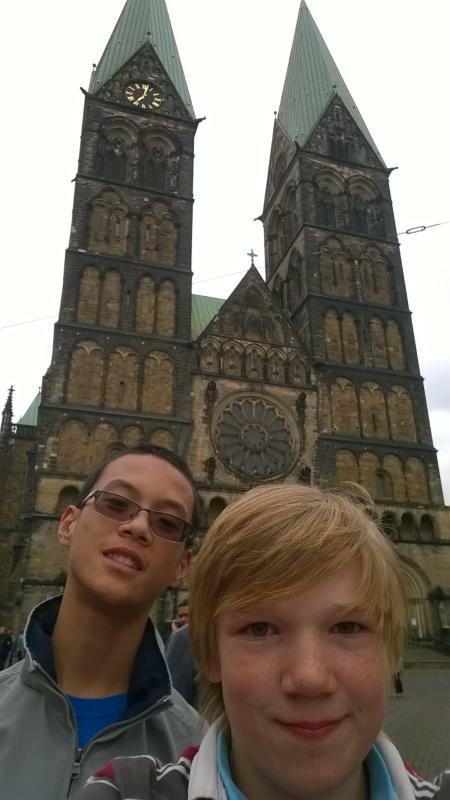 This past weekend, I went to Bremen with my host mother and Lauritz. The city is very beautiful. Today Brice and I will go on a 10 kilometer run. All in all, I have lots of fun. "I had a great second week at the Schulzes and at school. I have gotten the news that the Plate family cannot host me for the next three weeks because their grandma is very ill. So I will be staying with a classmate's family for that time. The classmate's name is Lauritz and he is a nice boy in my class. He has told me that his only pet is a horse. He has also told me that to get to school I must ride the bus (the family lives 15km outside of Nienburg. I am fine with that. This week I swam at the local swimming pool by myself because Constantin and Sophia Schulz have to work. I also went rowing with students from the school, Albert-Schweitzer-Schule. On the weekend, I went to Hannover and the guest parents gave me a tour of the city. It was a lot of fun." "...I am having a great time with the Schulze family where I'm staying for the first two weeks [of my six-week stay in Nienburg]. We did a lot of things. First, Constantin, Sophia, and I went swimming in the new "Schwimmbad" [swimming pool]. Then I went rowing for my first time. Finally, on the weekend we went to a lake called "Steinhuder Meer" [Steinhude Sea]. It was a lot of fun. I am learning a lot of German at school. 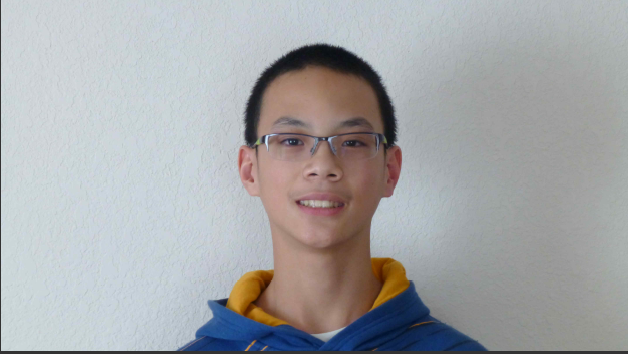 My classmates help translate for me from time to time...."
Kean will spend the next three weeks with the Plate family whose oldest son, Paul, came to Las Cruces with Constantin and a group of Albert-Schweitzer-Schule students in October 2012. Kean's other host siblings are Erik and Henrike. Erik was an exchange student in Iowa for the 2013/14 school year. During the last week of his stay in Nienburg, Kean will be back with the Schulze family. Kean will travel to Nienburg May30 for a six week stay. He will be hosted by two Albert-Schweitzer-Schule Students who participated in an exchange with Las Cruces' Centennial High School in 2012. Watch for more to come from Kean and his facilitators.